‘The Common Man’, Mr. Alex Ray, At Sandwich Fair 2017. This is Alex Ray, the founder and owner of ‘The Common Man‘ chain of HUGELY successful restaurants in New Hampshire — and a now noted philanthropist and avid thespian. 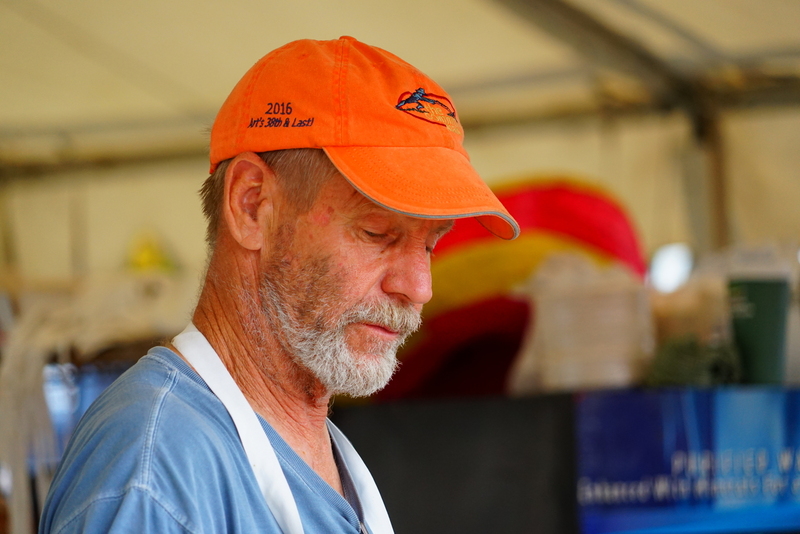 Alex has been a feature of the Sandwich Fair for 28-years or more. And despite is fame and fortune (which he underplays) he enjoys serving up his sleeves (if he has any) and cooking and serving at the Fair. I met Alex in 1998 when he was setting up the “Town Docks” restaurant in Meredith and I was launching “Waiters of Waters” (WOW). Alex helped us TREMENDOUSLY. At our first meeting, once I talked him into coming down from the roof (which he was repairing) he insisted that we needed a 1-page contract between us and the restaurants that spelled out everything including the discounts and who paid the NH meals tax. That contract saved our bacon a number of times. Alex is GOOD. I enjoy taking pictures of him (as you can tell). I have BEGGED him to let me write his biography BUT he is adamant that he does not have a story to tell.